The tiny South Pacific island nation of Kiribati issued passports to North Korean businessmen until 2004 as a "means of generating revenue," its president has admitted. There had been speculation for some time that North Koreans engaged in illicit activities such as arms deals were illegally obtaining passports from small countries. 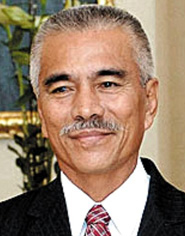 Appearing recently on Australian radio, Kiribati President Anote Tong said he was embarrassed that the passports were reportedly related to international crime. "I can assure you that we had corrected that situation in 2004 when we stopped issuing these passports," he said. Late last year, a Japanese activist group said two agents from North Korea, Han Chol and Ju Ok-hui, used passports issued by Kiribati and the Seychelles. They are board members of North Korea's Tongsin International Trading Corporation, an agency suspected of illegally exporting weapons to Burma and other countries, the group added. Both Han and Ju were given passports by the Kiribati government in 1996 and by the Seychelles in 2007. The countries reportedly sold passports to foreign businessmen but abandoned the practice due to mounting worries about illicit activities. A Foreign Ministry official in Seoul said, "Kiribati has been neutral since it won independence from the U.K. in 1979. "It would have been easier for the North Korean agents to travel with those passports rather than with North Korean ones."